Raumfahrt+Astronomie-Blog von CENAP - Blog: Astronomie - Bevy of mysterious fast radio bursts spotted by Canadian telescope B﻿ounty includes second known example of a repeating burst. The CHIME radio observatory in Canada has detected a fast-radio burst. A radio telescope in Canada has proved its mettle in finding many new examples of fast radio bursts (FRBs) — giving astronomers one of their best shots yet at unraveling the mystery of these cosmic flashes. “Look! We see FRBs,” Deborah Good, an astronomer at the University of British Columbia in Vancouver, Canada, told a meeting of the American Astronomical Society in Seattle, Washington, on 7 January. Good reported the first results from the Canadian Hydrogen Intensity Mapping Experiment (CHIME), a telescope that was originally designed to explore the early Universe but has turned out to be ideal for detecting FRBs. First spotted in 20071, FRBs are one of the most intriguing mysteries in astrophysics. They appear all over the sky, and astronomers aren't sure what causes them. In early testing during July and August, before it began full operations, CHIME spotted 13 FRBs. Prior to this, astronomers had between 50 and 60 examples. The more FRBs that astronomers find, the greater the chance they can start to pin down their origin. "If we had 1,000 examples, we would be able to say many more things about what FRBs are like," Good said. CHIME also detected only the second known FRB that repeats, meaning that the radio flashes re-appear at the same point in the sky. It saw the repeater pop up at least five separate times, the first on 14 August, Good said. "We're very excited," she told the meeting. 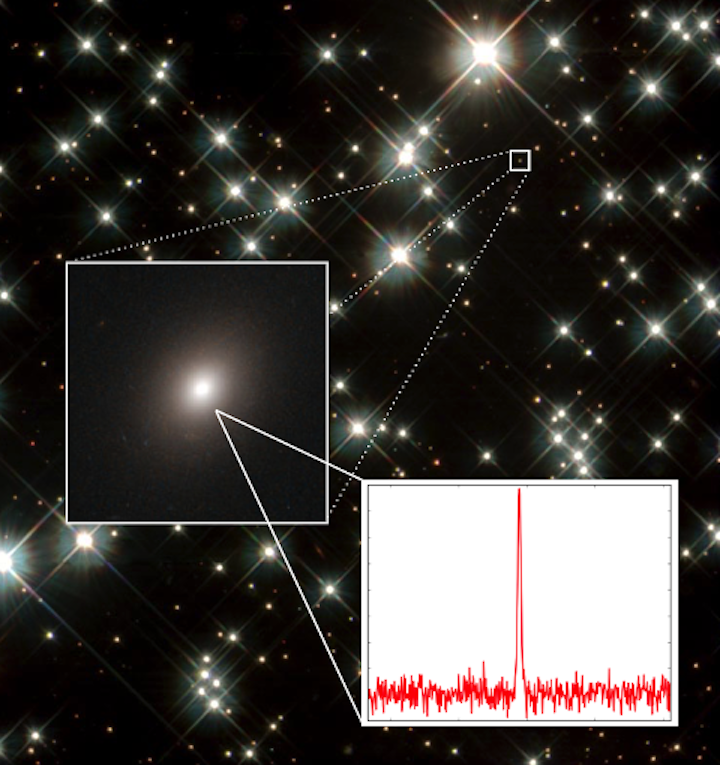 The only other known repeating FRB is one that first appeared in 20122. It seems to originate in a galaxy some 2.5 billion light-years from Earth3. Finding a second repeater confirms that the first was not some kind of freak event. CHIME has also detected the lowest-frequency FRB known so far, Good said. It appeared at wavelengths of 400 megahertz, breaking the previous record of 700 megahertz. Previous hunts with other telescopes had not found any FRBs at these lower wavelengths. Studying lower-frequency FRBs, and the way in which their radiation is scattered on the way to Earth, can reveal more about the environment in which the bursts were born. This includes whether there is a lot of turbulent gas such as in a star-forming region. The CHIME observatory is located outside Penticton, British Columbia. It consists of four 100-metre-long, semi-cylindrical antennas that look like a half-pipe for snowboarding. The facility operates around the clock and scans the entire northern sky each day — giving it an excellent shot at catching transient FRBs. The bounty of detections came when the instrument was not yet at its full sensitivity, which suggests that it could eventually spot as many as dozens of FRBs each day. Good said the findings will appear in Nature on 9 January. A new radio telescope has spotted scores of mysterious fast radio bursts — including the second known repeating one. More than a decade ago, astronomers discovered that every day the sky sparkles with thousands of bursts of radio waves. These flashes are hundreds of millions of times more energetic than the sun but so fleeting that astronomers miss them time and again. That has made it hard to pin down the origins of these so-called “fast radio bursts,” or FRBs for short. Yet there are tantalizing hints that they could represent an entirely new class of astrophysical objects. As such, they’re arguably one of the most intriguing mysteries in astrophysics, which makes their often-missed detection even more infuriating. Luckily, the tides are turning. 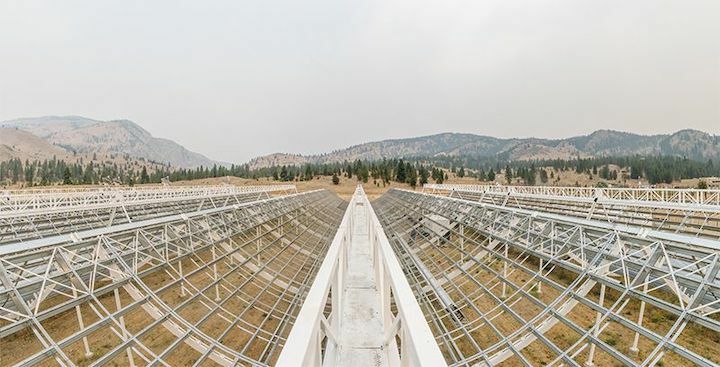 A new telescope known as the Canadian Hydrogen Intensity Mapping Experiment (CHIME), nestled in the mountains of British Columbia, has already spotted 13 bursts. And of those bursts, reported January 9th in Nature and at a meeting of the American Astronomical Society, one appears to repeat — an advance that might help astronomers settle its exotic origin. The bursts were detected over a period of just three weeks last summer, while CHIME was running at only a fraction of its full capacity. “Immediately, it was clear that this is good news,” said Victoria Kaspi (McGill University) at the meeting. First, it’s a resounding endorsement of the telescope’s capabilities. And while Kaspi was hesitant to say just how many bursts might become visible once the telescope is in full swing, early estimates suggest that CHIME might ultimately detect anywhere from 2 to 50 bursts per day — a feat that would truly revolutionize the field. Second, Kaspi noted that the radio waves from many of these bursts appear to have been scattered on their journey to Earth. That means that the FRBs likely originated in special environments that contain a lot of turbulent gas, such as near a supermassive black hole, a young supernova remnant, or a star-forming region, she said. The first repeating FRB was detected at the Parkes radio telescope. The repeated detections enabled astronomers to locate its home in a dwarf galaxy on the outskirts of an elliptical galaxy. The highlight of the bounty is the single burst that flared time and again. First detected on August 14th, CHIME saw it pop up five additional times. The only other known repeating FRB was detected in 2012 and has reappeared hundreds of times since. So, a second “suggests that these repeaters are not as rare as we might have thought previously,” Kaspi said. What’s more: Both repeaters give important clues about their origins. The sheer fact that the bursts repeat, for example, suggest that they cannot be produced by some one-off cataclysmic event, like a core-collapse supernova or a merger of neutron stars. Both events would only occur once and a second burst would be impossible. So what might cause such a downward drift? Late last year, Hessels attempted to answer that very questionwith regards to the first repeating radio burst. He argued that the drift could be intrinsic to the burst, meaning the burst starts very close to an energetic source (say, a supermassive black hole) and then moves farther away over time. Such a pattern has been seen before. As solar flares propagate outward, for example, the Sun’s magnetic field strength drops — an effect that causes the flare’s radio emission to similarly drop. Alternatively, the drift could come from something around the burst. A cloud of extremely hot and electrically charged gas, or plasma, for example, might act as a lens, which would bend the radio waves in much the same way that water bends rays of light. The fact that the two events look so similar is what most excites Hessels about the newest repeater. “It really suggests they’re of the same ilk,” he says. And while Kaspi agrees that the similarity is “striking,” she notes that we can’t draw any firm conclusions yet. Astronomers are keeping their eyes on the mysterious burst with the hope that they will be able to tie it to the galaxy it lives in, enabling them to better understand its environment. And of course, they’re also eagerly awaiting the scores of radio bursts that CHIME will soon detect. CHIME/FRB Collaboration “A second source of repeating fast radio bursts.” Nature, available online on 9 January 2019. CHIME/FRB Collaboration “Observations of fast radio bursts at frequencies down to 400 megahertz.” Nature, available online on 9 January 2019. J.W.T. Hessels et al. “FRB 121102 Bursts Show Complex Time-Frequency Structure.” Submitted to Astrophysical Journal.